The Queen Avenue crossing gates in action in December 2015. ODOT says there are 60 switching operations a day at the crossing. 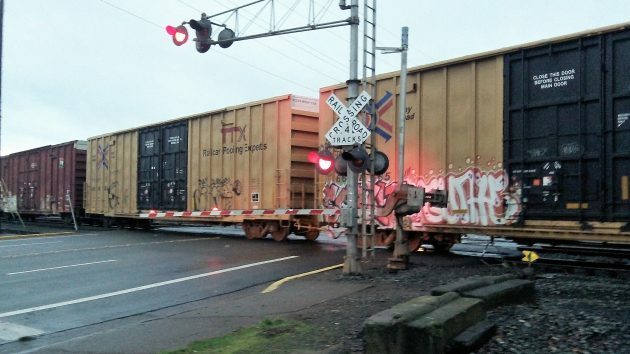 The Oregon Transportation Commission is poised to approve a project to make Albany’s Queen Avenue railroad crossing safer and, for cars, smoother. But it won’t deal with traffic delays when the gates are down. The commission meets in Enterprise on Aug. 17 and 18. On the 18th, it is scheduled to act on adding the Queen Avenue project to the Statewide Transportation Improvement Plan or STIP for 2015-18. ODOT says the project would cost $1,320,000 and be done over the next three years. Preliminary engineering is scheduled for 2018. A small amount of right-of-way would have to be acquired. That and the relocation of utilities would be done in 2019. And construction would take place in 2020. The project calls for upgrading the signal system, improving all four sets of tracks with concrete panels in the roadway, repaving the approaches on Queen, installing an “exit gate” for east-bound traffic, and redoing the sidewalks to comply with the federal disabilities law. According to ODOT, the crossing is used by an average of nearly 8,500 vehicles a day. It is closed to traffic to allow the passage of 16 daily freight trains, six passenger trains, and 60 switching operations. ODOT says the project is prompted by safety concerns. There have been two fatalities in recent years as men on bicycles went around the lowered crossing gate arms, not realizing that another train was coming after one had passed or stopped. I think they count every change in direction of the historic SD7 locomotive as a switching move. Just put up signs telling people to stop and tack pictures of the 60 year old locomotive and call it good.